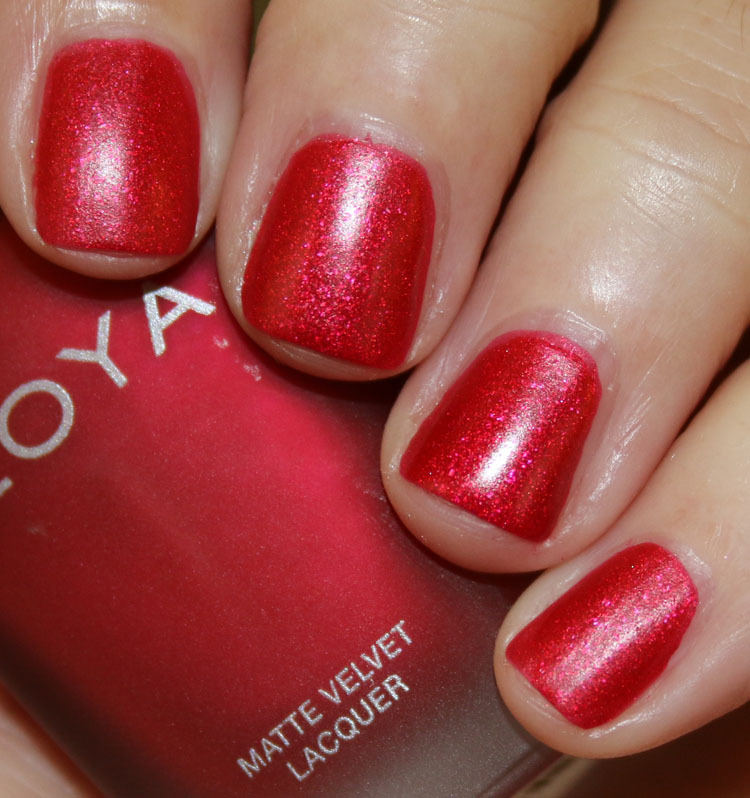 The Zoya MatteVelvet Holiday/Winter 2015 collection features six new MatteVelvet shades. 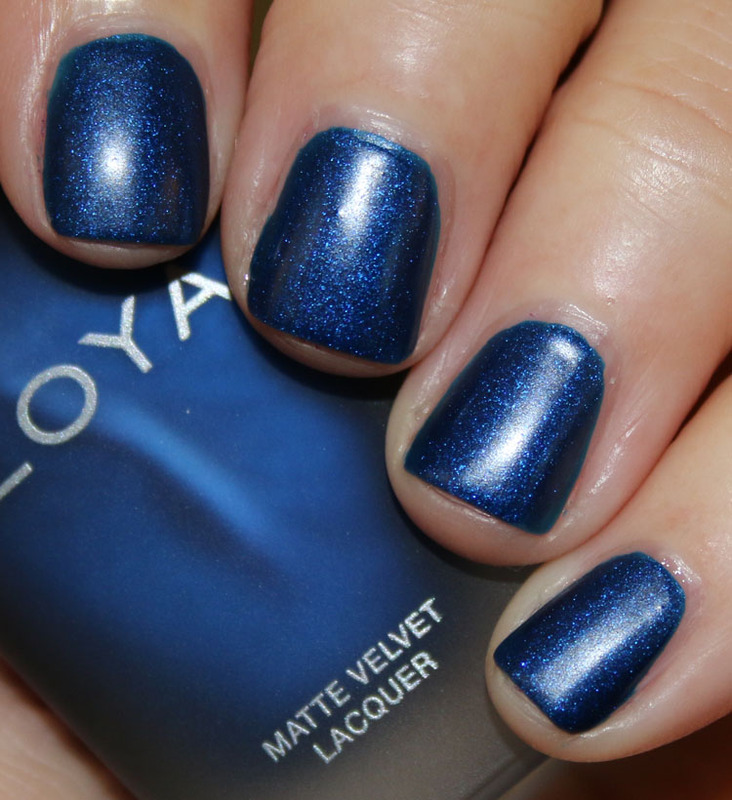 MatteVelvet’s have an opaque, matte finish but still have the lovely pearl-flecked look that so many Zoya colors have. They are meant to be worn without a top coat, however adding a top coat makes them SERIOUSLY sparkle! Check out Honor with a top coat on my Instagram account. Gorgeous, right? Aspen is a bright white with a micronized diamond pearl fleck. I’m totally digging this shade despite the fact that it took three thin coats to get it completely even on me. Sue is a light champagne gold with multi-hued oyster shell pearl fleck. This is a very pretty princess-like shade, so sparkly! This was two coats. Amal is a bright red with ruby red pearl fleck. 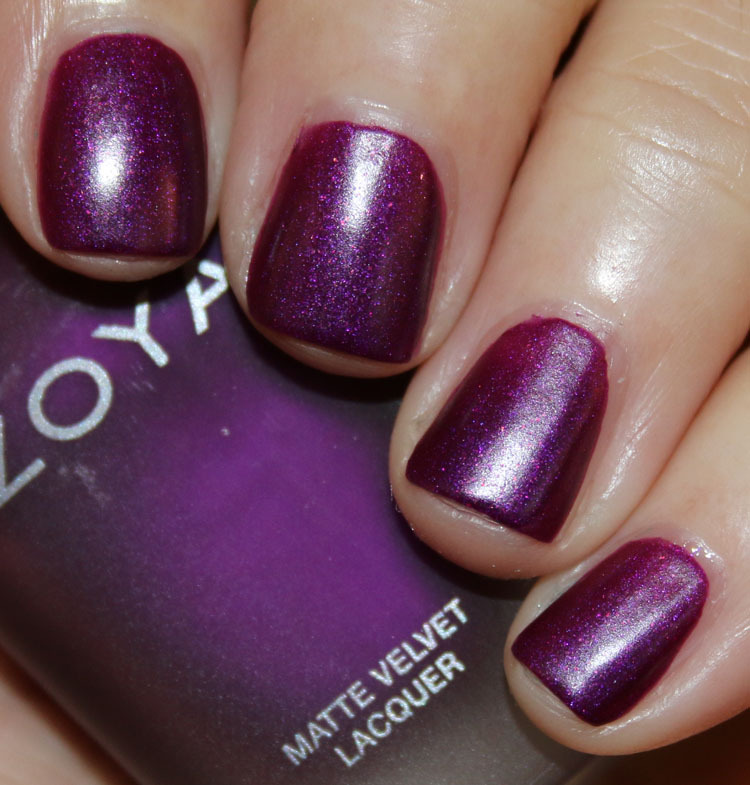 I like this one but it’s even better with a top coat for me. This was two coats. Iris is a deep amethyst with fuchsia pearl fleck. Gorgeous color either with or without a top coat! This was two coats. Honor is a emerald green with emerald pearl fleck. 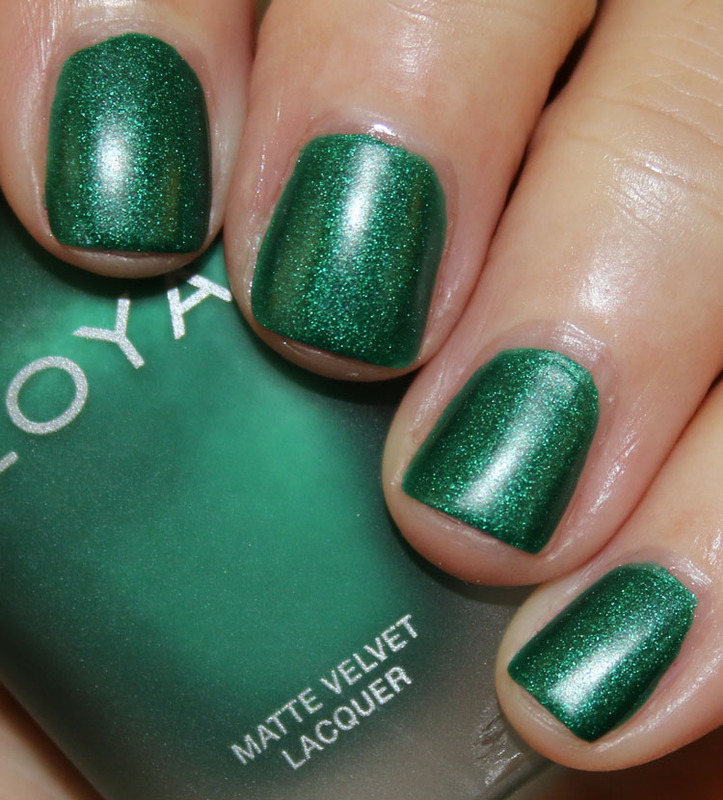 Loving this shade so much right now but with a top coat it screams “CHRISTMAS! !” This was two coats. Yves is a sapphire blue with blue pearl fleck. Lovely deep blue and this was two coats. I love the formula of these because they are all nearly perfect with just two coats, and they are matte, but not flat or boring. I do think they all look totally amazing with a top coat as well though! 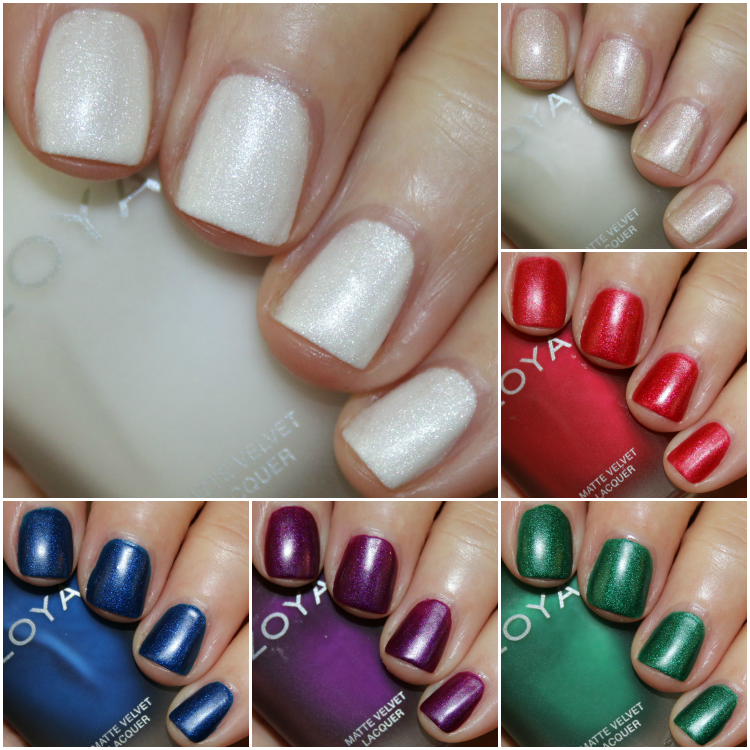 You can find these on the Zoya site now and they are $10.00 each. Yippee!! I need Sue and Yves for sure! Maybe Aspen. Definitely with top coat tho. These shades look so fancy!! 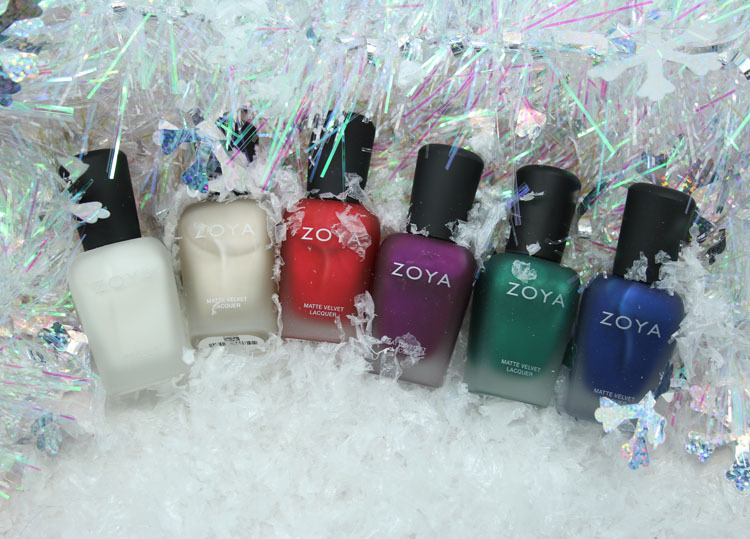 Is this Zoya’s only Winter/Holiday collection this year? The only one I am aware of so far! I’m not usually a big fan of matte polish, but these are so lovely. They are sooo nice with a top coat! I love the red and green colors! I’d love to wear those for the holidays. Unfortunately I’m not allowed to wear nail polish while I’m in school… I graduate in February, so I can’t wait to get myself a nice manicure then! Aww man, that would be hard! I love the original Matte Velvets, so I was really excited when I saw these were being released! And they don’t disappoint. The colors are all fabulous–hard to choose a favorite! They are really pretty but Honor is so stunning! YES! I’ve been waiting for you to swatch these so I could decide which ones I want. Definitely picking up Aspen and Honor (your Instagram picture with the topcoat sold me like last week..) and I’m on the fence about Sue (and the rest of them really). Do you know if these are available to purchase at Ulta? I’d much rather buy them in store if I can because I don’t wanna wait! I’m not sure, sorry! I don’t see them on the Ulta website though. Wow. For me, I’ll probably pick up Honor and Aspen. I can only imagine how amazing they would look with a top coat! Sue looks like it would sing with top coat!! I lurve Aspen and Sue! I love Aspen – a gorgeous, sparkling winter white! It’s what I wanted OPI’s Ski Slope Sweetie to be, but on the nail, SSS had an odd yellow-gold cast which clashed with my skin tone. I always wear a top coat on top of matte polish, not only because matte is not really my favourite look, but also because I find that matte polishes tend to chip more quickly than others, and a top coat helps prevent that.